While I’m waiting for the new Volt to arrive, I’ve been researching the economics of a residential solar system. By “researching,” I actually mean geeking-out on all the technical details, and attempting to unravel and reconstruct the engineering and economics of the systems that I’m considering. There have been many discoveries along the way, some of which are explained in excruciating detail here for two reasons: 1) because Google couldn’t provide me the answers that I was seeking, and 2) I probably need some better hobbies. 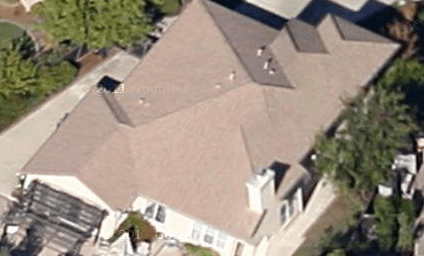 My home in Pleasanton bakes in the California sun, and has an unobstructed southern facing roof that if perfectly situated for photovoltaic panels. Our electricity demand has been about 6,000 kWh per year, which isn’t too high for a house of our size in Pleasanton. The car will add about 2,400 kWh to that, and with the standard tiered rate plan, electricity costs escalate considerably with additional usage. Our friendly local utility, PG&E, is here to help. They have a lots of information on their website http://www.pge.com/electricvehicles/, including a spreadsheet to predict the economics of switching from a standard tiered rate plan (E-1) to a plug-in electric vehicle (PEV) plan with variable rates depending on time-of-use (E-9A or E-9B). Separately, they also have lots of information on solar installations, including a different time-of-use rate plan (E-6) designed to benefit residential solar customers. Both the E-6 and E-9 rate plans are eligible for “net-metering”, which means that the electric meter runs in both directions: the utility pays me when I generate more than I use, I pay them when the opposite is true, and we settle up on an annual basis. 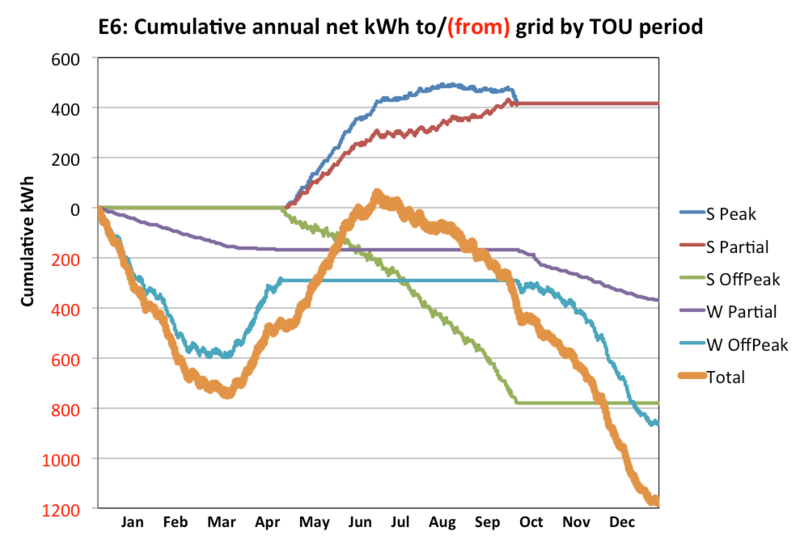 Since these are time-of-use (TOU) rate plans, the rate is higher during peak times (like summer afternoons), and lower during low demand times (like nights). So I sell electrons to the grid at high rates on sunny days, and buy them back for cheap at night when I charge the car. Perfect! Download 52 weeks of hourly SmartMeter data from PGE’s website. This gives me the hour-by-hour electricity demand for my own house in the course of one full year. Unfortunately, this required 52 separate downloads. Thanks, PG&E. Import into Excel, and reformat into 8,760 rows, one for each hour in the year. Add the anticipated demand from charging the Volt on a Level 2 charger: 6 kWh per hour, for two hours, starting at midnight, every weeknight. For each of the 8,760 data points, figure out which of five different rates apply for each hour, based on the month and time of day. Repeat this for E-6 and E-9 plans. Now figure out the output from my hypothetical solar system for each of those 8,760 hours. This depends on lots of things: the panel specs, number of panels, inverter, roof orientation, weather, and so on… While this may seem completely intractable, the US Government has developed an application that does all that and more. The National Renewable Energy Laboratory (NREL) has developed a software tool called System Advisor Model (SAM) that simulates the performance of systems under a wide range of conditions. I fed SAM the 8,760 data points that describe my annual usage, and it gave me back the hourly net kWh to or from the grid. Way cool. With the net energy flow pasted into the spreadsheet, I could now simulate a full year of operating a solar array and a plug-in electric car, both under the E-6 rate plan and the E-9 rate plan. The system that I modeled consisted of 22 panels, each rated at 235W, for a total rated output of 5.17kW. For my installation, this will provide about 7,800 kWh of energy during a year, and with the car I’ll need about 9,000 kWh. So I’ll take about 1,200 kWh more off the grid than I’ll send onto the grid. 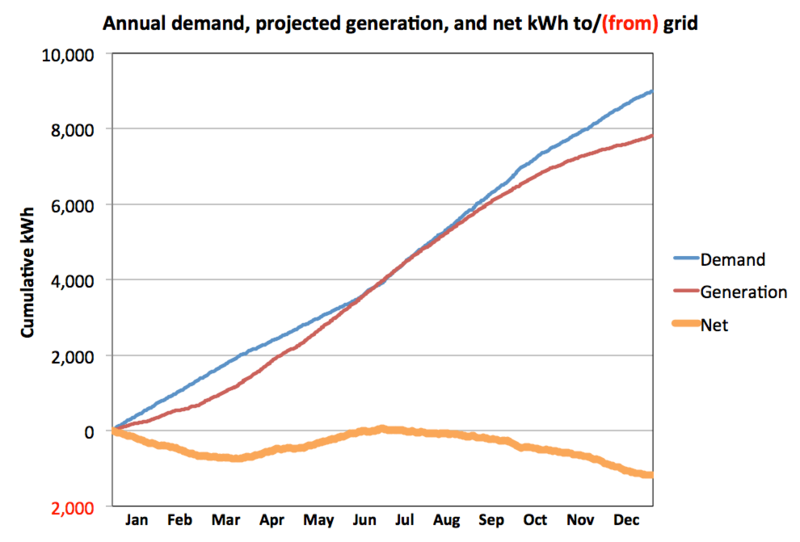 The chart below shows cumulative demand and generation throughout one full year. The E-6 rate plan has several different rates depending on the time of day and season. 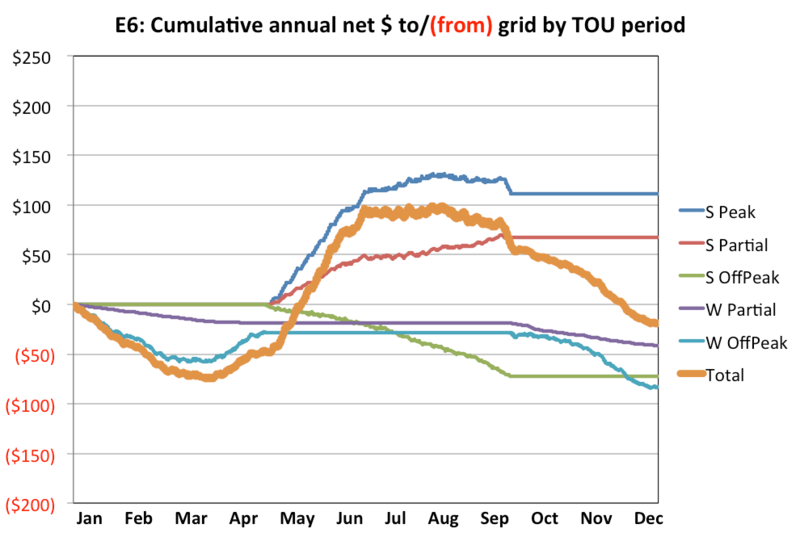 The next chart shows net energy to and from the grid during the year for each of the rate categories: summer peak, summer partial-peak, summer off-peak, winter partial-peak, and winter off-peak. 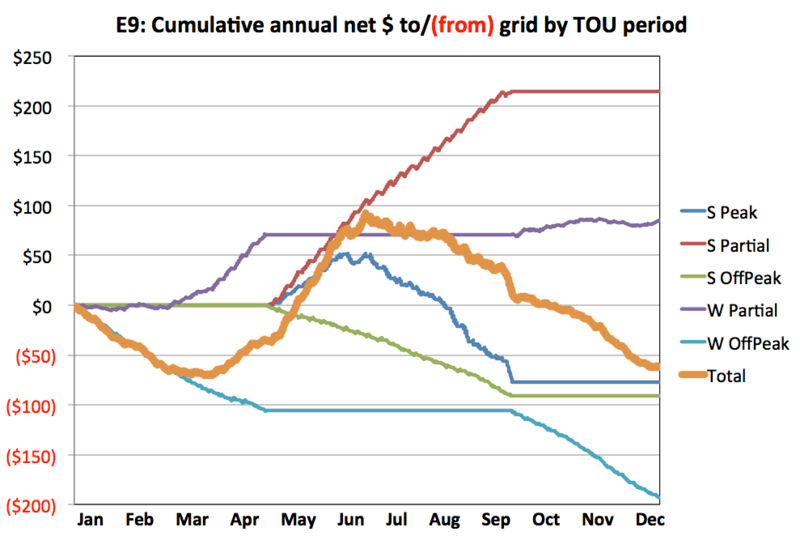 Though I’m 1,200 kWh in debt by the end of year, the picture in dollars is quite different. The power that I generate during the summer peak and summer partial peak periods (the top two lines) is much pricier than the power that I have to buy during the winter periods. So with the E-6 rate plan, I finish this simulated year owing PG&E exactly $18.19. The E-9A rate plan is similar to E-6, but the rates are more leveraged. The peak rates last for more hours during the day and evening, and the off-peak rates (though lower) last for a shorter period of time. I wanted to figure out if the higher peak rates and long peak hours would be a net benefit with solar generation. 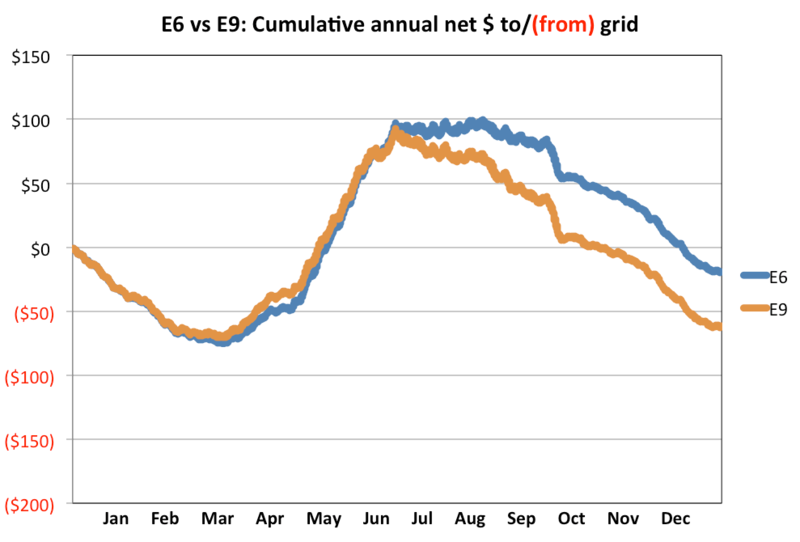 The E-9 chart shows what happens: the summer partial-peak period is very profitable, but the costs during the winter off-peak period completely offset the benefits. At the end of the year, I owe PG&E a total of $64.41. For my circumstances, the E-6 plan is a better option than the E-9 plan, to the tune of about $40. Now you know. Your results may vary. There are lots of great resources freely available online that are very helpful for obsessed engineers that are interested in finding ways to spend some of their free time. PGE_TOU_Compare.xls (docs.google.com) is a version of the spreadsheet that I used to calculate all of this stuff. Unfortunately, it was too large to work natively as a Google Spreadsheet, so it has to be downloaded old-skool style. NREL (nrel.gov) developed the System Advisor Model software, which was good for many hours of simulated enjoyment. Open Energy Information (openei.org) provides crowd-sourced data on rate plans for utilities across the country. I found the data there for the E-1 plan that I currently use, updated the data for E-6, and added the data for E-9. The SAM application also interfaces directly with this database. The OpenPV Project (openpv.nrel.gov) was also developed by NREL. It is a comprehensive database of solar installations across the country. It has detailed data on the location, size, and installed cost of PV installations across the country. Compare the statistics from your quotes with those for other systems installed in your neighborhood. As I’ve been planning my system, I’ve been fortunate to work with three very reputable solar installers: Real Goods, SunWize, and REC. If I had three houses, I would buy one from each. Wow. That was a lot of analysis! I’m glad you did it and not me :) It would be helpful if PG&E would allow one download rather than 52.